Need a break? 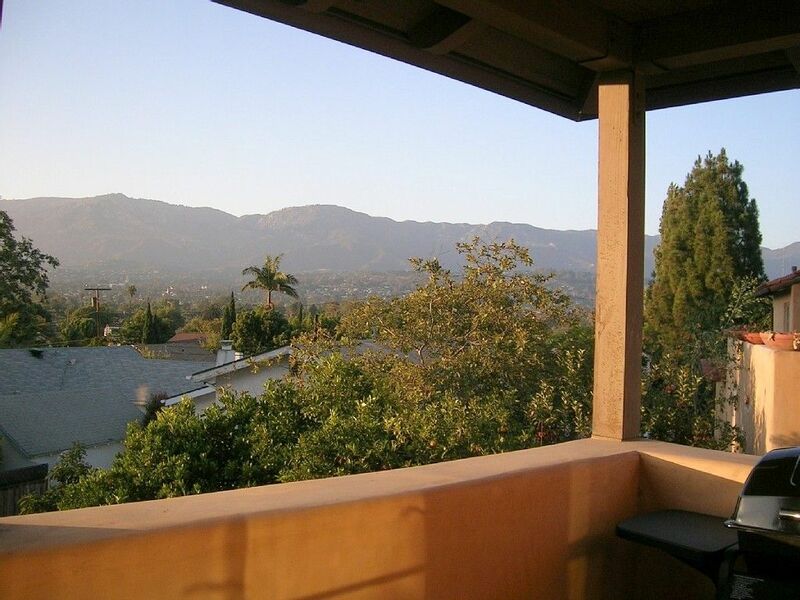 Beautiful Santa Barbara, California, could be the answer! Come stay in this luxurious furnished Mediterranean-style second story casita (or guest studio) in Santa Barbara. The casita includes such details as gorgeous reclaimed Canadian Douglas Fir wood floors, French doors, and custom maple kitchen cabinets with granite tile countertops. At 450 square feet inside, it offers a spacious comfortable feeling and tons of amenities. There are windows all around with amazing views of the City and mountains, or enjoy the views on your own generous balcony. You can also wander through the garden to rest and relax, or perhaps enjoy a picnic, in the sunny back yard! And the casita is conveniently located approximately one mile from downtown or two from the beach, Stearns Wharf and the Harbor. The casita encompasses the entire 2nd story of a free-standing garage at the back of a 1/4-acre property -- no shared walls, no living spaces above or below! This is a perfect home away from home for business and vacation! The casita can be rented on its own or in addition to our other rental on the property -- VRBO #916179 or look for the "Click Here to see All My Rental Listings" links on this listing). The elegant bathroom has stone tile floors, beautiful dark wood vanity and a tub/shower combo. The deep soaking tub with arm rests is wonderful when you need pampering; the bath pillow and bath salts add that extra special touch. Large thick and thirsty towels, as well as a blow dryer, toilet paper, Kleenex, lotion and hand soap (at least enough to get you through the first few days) are included. Emergency toiletries are available. Although the casita is in the City, it has a touch of a rural feeling, with large oak and Eucalyptus groves in view on 2 sides, as well as stunning views of the city, the Riviera and the mountains on the other 2 sides. High quality linens, as well as laundry service for these linens, are provided. Thick and thirsty bath towels, as well as laundry service for these towels (and the provided beach and kitchen tea towels), included. Free high speed wireless internet access available. Coffee maker, grinder, French press and one of those little espresso pots. Also included are spices, basic pantry items to get you started, such as oil and vinegar, paper towels, trash bags, and more. Enjoy complimentary fresh roasted coffee beans (for a pot or 2) and tea bags, cream and sugar, and various basics to tide you over until your first shopping trip. An entertainment system with 32' flat screen HDTV with digital cable (includes all movie/HD/music channels and DVR), a sound system, and CD/ DVD/ Tuner. Cookbooks, novels and various Guides (for restaurants, day hikes, things to do, etc.). If you're looking for quieter at-home entertainment, you can choose from a selection of card and board games, and paperback books. Not an actual library, however many music channels are available. From rock to soul to pop to hip hop and so on. Wander through the garden to rest and relax in the sun, or perhaps enjoy a picnic (picnic backpack, at the patio table between the fruit trees. Enjoy the stunning views on your own generous balcony. So sorry! There is a 17-step exterior staircase entry. The studio is situated over detached garage. Entry is by a 17-step exterior staircase to studio. Owners live in the main house on property and are happy to assist with questions about the casita and Santa Barbara. Great place to stay in Santa Barbara. This property's location is great. It has everything we need and then some for an extended stay. Our second year in a row and we're booked for next year! This studio apartment sits atop the separate garage on the property, having great views in all directions, especially from the balcony. The kitchen is large and well-appointed for those who like to cook. Downtown SB is minutes away. We were visiting SB for an extended stay at the University, and found the property to be everything we could have wanted. Santa Barbara is magical. Spanish Days/architecture/public spaces and the best Yoga Soup studio ever all walking distance from this perch with a twinkling light view every night. Watch the sun rise and set from the studio. Weather is Devine with plenty of breezes off the hill. This is a great way to experience Santa Barbara living. When something is this magical you have to share the experience!I have never given an online review! To anyone looking for a place to stay in Santa Barbara I urge you to stop your search. You have landed on a very special place. First the pictures don't do the place justice. The views are etched in my memory and our time here will forever be in my heart. I was looking for a place to stay for 32 days and I am an extensive researcher, I am particular, polite always, but do expect what is promised at hotel but if it's not what is promised I asked to be moved. You are given what you are promised at this very magical place. Mary and Tom are truly the most thoughtful, respectful host, walking the fine line of giving us our privacy yet being completely accommodating and helpful. Their thoughtfulness can not be beat! The gentle breeze, the views, the very comfortable bed, the awesome shower and water pressure, the OUTSTANDING attention to details, every detail, the LOCATION LOCATION!, the memories you will make. Everything is close by, I had my morning walk at Chase Palm Park everyday, gorgeous, five minutes by car. Everything I wanted to do was just a short trip. I walked the neighborhood. We also had 2 day trips that were totally manageable. Near by dining great! Near by groceries,beaches, mall, movies, State Street, I can't stress enough the amazing location.The thoughtful host! We felt very well cared for and everything went beautifully. Mary and Tom are just so wonderful. Will I return again? I only hope I am so fortunate! To open the morning curtains and be greeted with such a view and the breeze, we keep talking about the breeze and the calmness, the comfort and care. Each afternoon or sometime during the day my plan was to sit outside and read a book, instead I would close my eyes and feel the warmth of the sun with the gentle breeze or gaze upon the view. The view to the left has five palm trees with a huge pine to their left off in the distance and to watch the sunset, a sight to behold. As I said at the beginning of this, my first ever online review, look no more you've found your Santa Barbara home away from home, you will be well cared for and what you are promised is given. Your privacy is respected and your needs are met. You hearts will be forever filled with warm and endearing memories and you too will long to return after your first visit. Honestly, I am tough to please and all my expectations were exceeded. Mary and Tom have a little slice of paradise and we are lucky they are willing to share such a special place with us. Very comfortable and well equipped accommodation. Outside and inside are equally enjoyable. Recommend to anyone considering a VRBO in Santa Barbara. In a centrally located neighborhood, this beautiful casita is approximately 1 mile from downtown Santa Barbara or 2 from the harbor and beach -- an easy distance to enjoy all Santa Barbara has to offer. Close to downtown businesses, shopping, museums, restaurants, night clubs, the Santa Barbara Mission, the Botanical gardens, the County Bowl (for live shows), golf courses, the harbor and Stearns Wharf, whale watching, island and coastal boat tours, bike and electric car rentals. Although the casita is in the City, it has a touch of a rural feeling, with large oak and Eucalyptus groves in view on 2 sides, as well as views of the city, Riviera and mountains on the other 2 sides. It is a perfect spot for a relaxing vacation or business trip! -Payment Terms and prices may vary (discounted) with 2 month (60 nights) or longer stays -Cleaning fee/Security-Damage Dep is minimum; Cleaning includes laundry service for provided linens and towels -Phone not included/cell reception is good; all utilities, Cable TV, hi speed wifi internet service included. -No mailbox service. P.O. Box recommended, if mail delivery needed.